Bougeault, P., P. Binder, A. Buzzi, R. Dirks, R. A. Houze, Jr., J. Kuettner, R. B. Smith, R. Steinacker, and H. Volkert, 2001: The MAP special observing period. Bull. Amer. Meteor. Soc., 82, 433-462. Houze, R. A., Jr., C. N. James, and S. Medina, 2001: Radar observations of precipitation and airflow on the Mediterranean side of the Alps: Autumn 1998 and 1999. Quart. J. Roy. Meteor. Soc., 127, 2537-2558. James, C. N., and R. A. Houze, Jr., 2001: A real-time four-dimensional Doppler dealiasing scheme. J. Atmos. Oceanic Technol., 18, 1674-1683. Bougeault, P., R. A. Houze, Jr., R. Rotunno, and H. Volkert: 2003: Editorial. Quart. J. Roy. Meteor. Soc., special MAP issue, 129, 341-343. 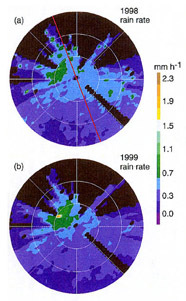 Hagen, M., and S. E. Yuter, 2003: Relations between radar reflectivity, liquid water content, and rainfall rate during the MAP-SOP. Quart. J. Roy. Meteor. Soc., special MAP issue, 129, 477-493. Medina, S., and R. A. Houze, Jr., 2003: Air motions and precipitation growth in Alpine storms. Quart. J. Roy. Meteor. Soc., special MAP issue, 129, 345-371. 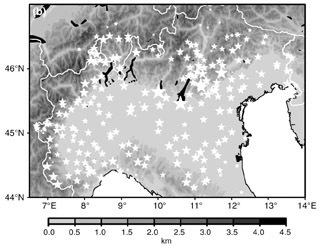 Steiner, M., O. Bousquet, R. A. Houze, Jr., B. F. Smull, and M. Mancini, 2003: Airflow within major Alpine river valleys under heavy rainfall. Quart. J. Roy. Meteor. Soc., special MAP issue, 129, 411-431. Yuter, S. E., and R. A. Houze, Jr., 2003: Microphysical modes of precipitation growth determined by S-band vertically pointing radar in orographic precipitation during MAP. Quart. J. Roy. Meteor. Soc., special MAP issue, 129, 455-476. Medina, S., B. F. Smull, R. A. Houze, Jr., and M. Steiner, 2005: Cross-barrier flow during orographic precipitation events: Results from MAP and IMPROVE. J. Atmos. Sci., 62, 3580-3598. 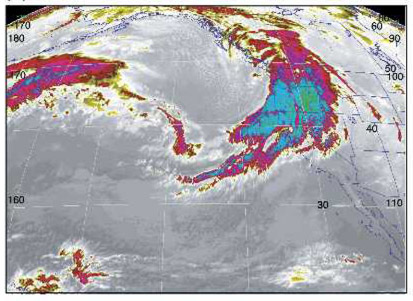 Rotunno, R., and R. A. Houze, Jr., 2007: Lessons on orographic precipitation from the Mesoscale Alpine Programme. Quart. J. Roy. Meteor. Soc., 133, 811-830.